As I write this blog post, I’m on the plane going home for Easter weekend. Yup that’s me on a plane unashamedly taking selfies while the guy next to me snores heavily and the guy in the opposite aisle is wondering how vain I must be. Just so you know, when people catch me taking selfies, I boldly scream out “I’m a blogger!” They usually understand. 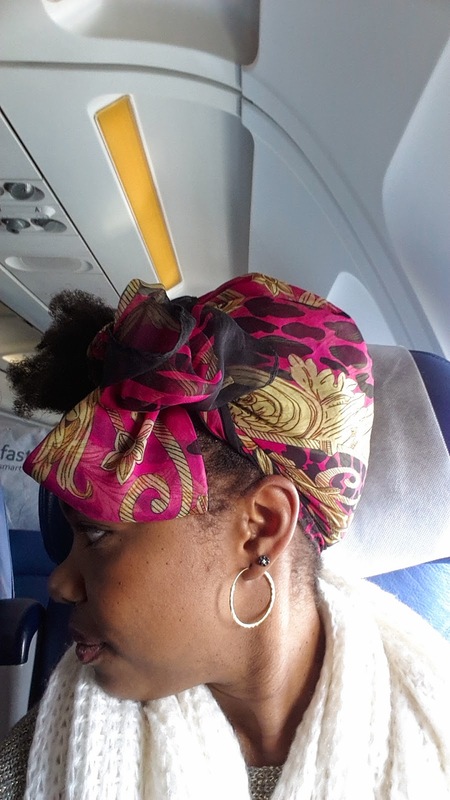 I thought it would be a great post to share with you how I keep my Fro travel safe. I’m sure you know what I mean by travel safe. 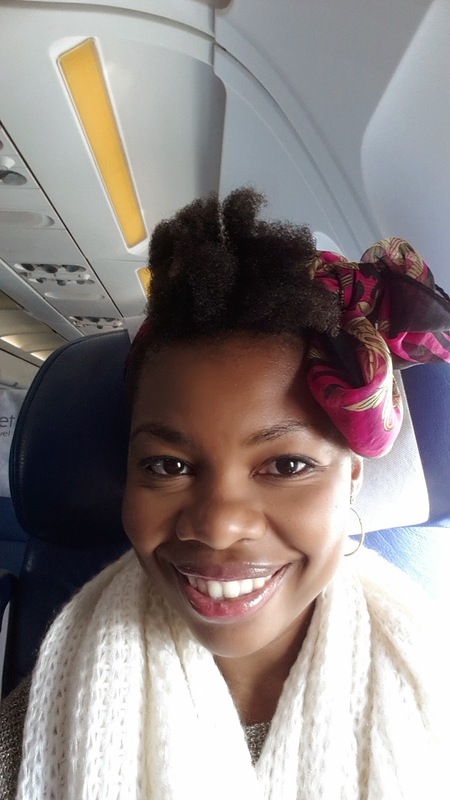 I can’t be the only one who wondered how on Earth to drive or fly somewhere with my hair the same way I rock it to work – our and about. Doesn’t it get messy? Tangled and worst of all…dry?! Well I’ve figured a routine that works for me and have stuck to it. 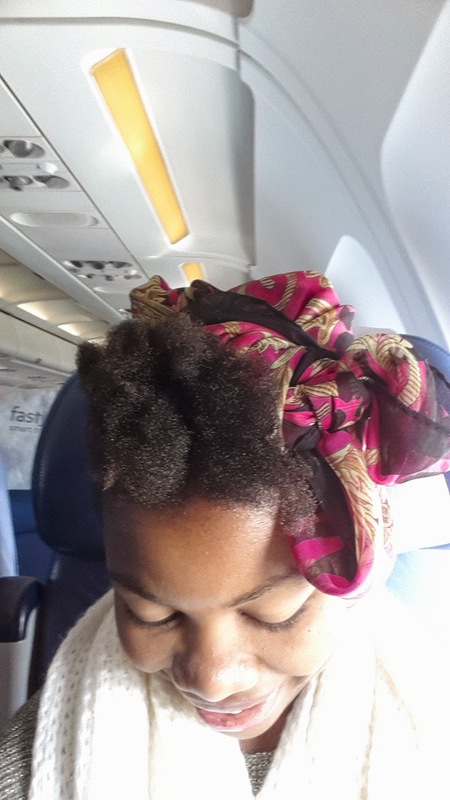 It came about almost two years ago when again, flying home with my then 1 year old fro that was too short to quickly tuck into an updo yet too long to just leave be. What with all of the leaning back against seats and non satin cased pillows, having a free fro whilst travelling doesn’t usually equal a cute arrival. What I do: I always sleep in chunky twists to keep my hair stretched, detangled and moisturised. To keep it simple, I do the same thing I do every night for the night before I depart. I spritz my hair with my daily spritz and put my hair into chunky twists. I wrap up and go to sleep. Morning of my departure, I just don’t undo my hair. I keep it in my satin scarf and tie another, cuter scarf on top and make it part of my easy going outfit (which is almost always consisting of leggings these days). When I reach my destination, depending on the time of day I’ll either unwrap and style if I’m still going to go out and about. Otherwise if I arrive in the evening as I did for this trip around, I twisted the front part that I had left out and went to bed. 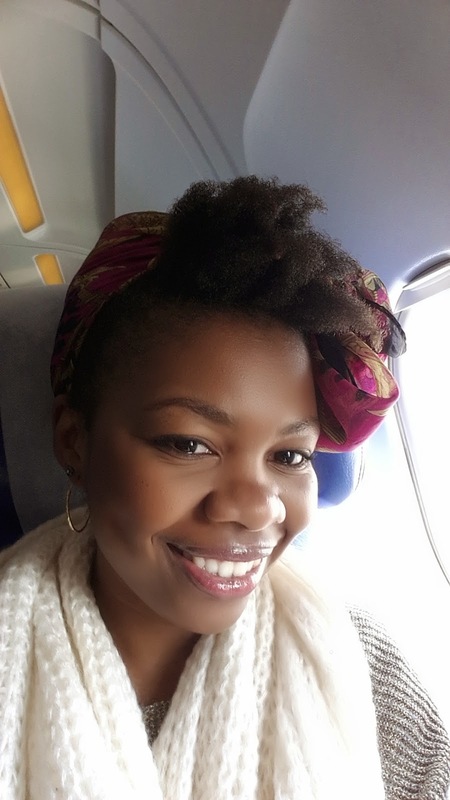 The next day, I spritzed and undid my twists and off I went about my first day in Dar. No tangled or matted mess from the nasty airplane headrest. That’s it. A scarf. They’re cheap,cute and total life savers. You can get them pretty much anywhere clothes are sold. SA readers, most of mine are from Mr. Price, including the one in these photos. Been struggling with my fro for the past year and I just cane across ur blog a week ago and I'm loving the advice and tips..